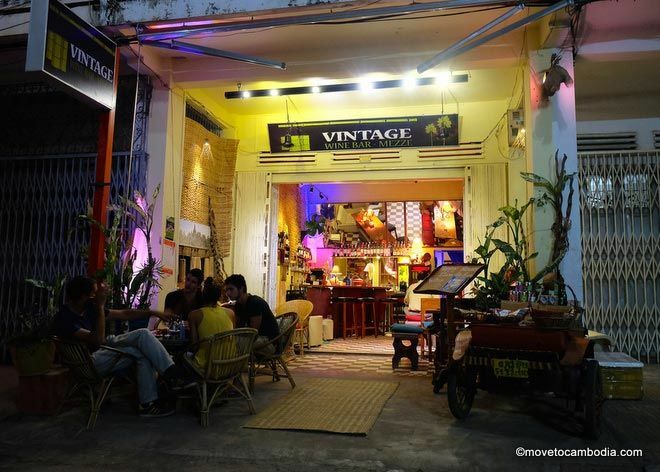 Battambang isn’t a city known for nightlife, but there are a few spots that are pleasant places to enjoy a drink. The team behind Miss Wong in Siem Reap made a name for itself there serving up exotic infused gin concoctions and tasty dim sum in an “old Shanghai”-themed cocktail bar. 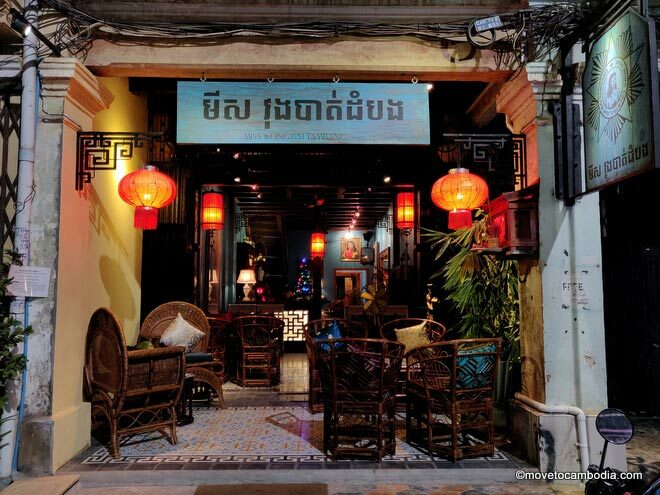 Now they’ve brought the same magic to Battambang, with the opening of Miss Wong Battambang. The dusky bar is filled with antique curiosity pieces from China and rattan furniture, and offers a menu of carefully curated cocktails and six types of dim sum dumplings and spring rolls. When we visited, the place was very quiet, but the streetside seating offered a nice view of early evening Battambang. You’ll be forgiven if a glance at the menu at Libations Bar at Bric-à-Brac, in the heart of colonial Battambang, leaves you with questions, such as: How is it possible that this unassuming but upscale streetside bar has the best selection of French wine and cheese in the country? How can they possibly sell French Champagne by the flute? The answer is that the international owners are absolute maniacs when it comes to French wine and cheese, and if you’re lucky enough to visit when they are there, they’ll make you realize how little you know about French wine and cheese by comparison. Luckily their enthusiasm is infectious and their homemade rillettes are to die for, and we left with a greater knowledge of washed-rind stinky French cheeses than we ever thought possible in Cambodia. Not a wine drinker? Try one of their double-shot gin and tonics or expertly made negronis. Definitely worth a visit. The Balcony used to be Battambang’s only real bar, and then it was called Riverside Balcony Bar. Located in a traditional Cambodian wooden house over the Sangker River, it’s one of the nicest places in town to stop for a sundowner. The bar has adopted a friendly home-away-from-home vibe, and it’s a place where expats, locals, and tourists gather to connect and relax after a long day of work or sightseeing — if you’re looking to meet people, The Balcony is a good place to do it, and the food is delicious to boot. The drinks menu offers a good selection from draft beers and house wines to some creative cocktails as well as a selection of whiskeys. Be sure to arrange a tuk tuk home, as it’s a bit far to walk at night and once you’re there it can be hard to find transportation. Reborn as a backpacker joint, Pomme has gone all out to transform itself into a place where their target audience will want to kick back and enjoy a drink or three. In addition to an extended happy hour from 5 to 9 p.m., there’s ample room for lounging inside, playing pool, or jamming on one of the house guitars. Live music happens on Saturdays or “brave the stage” on open mic night. 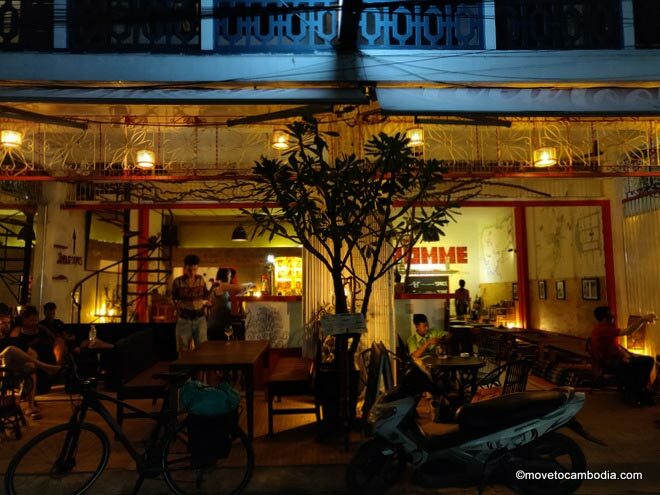 Pomme definitely has a hostel vibe, but not aggressively so, and the outdoor seating facing one of Battambang’s cutest streets is undeniably pleasant. We tried a glass of wine that was undrinkable, but we are willing to assume it was just an off night (or bottle). Here Be Dragons hostel also has a popular bar where you’ll find backpackers from around the world hobnobbing with Battambang’s younger expats. Happy hour is from 4 p.m. to 8 p.m. and they serve $0.75 Anchor draft and $2 cocktails. They have quiz night on Wednesdays and BBQs on Saturday nights.The bar is cheap and friendly, and while the crowd on most nights seems more backpacker than expat, you can still get a $7.50 jar of Pimm’s or a $7 Anchor beer tower and make a few new friends. Vintage Wine Bar Mezze strikes a low-key Europe-meets-Indochina vibe, with cool white-and-red tiled floors, comfortable cushioned seating, and large mirrors over the wooden bar. On arrival, you’ll be presented with a kind of wholesale menu of Cambodian products — rice wine, palm sugar, and the like — but the bar is stocked with well-chilled international wines, all reasonably priced by the glass or bottle, and paired, delightfully, with small baguette toasts topped with compound butter. Madison Corner is a popular expat hangout known for cheap drinks and good times. The food gets mixed reviews, but everyone agrees that it’s a fine place to enjoy a pitcher of beer or a glass of pineapple palm wine. At their daily happy hour, from 4 p.m. until 8 p.m., they serve $1 beer, pastis, and spirits. They’re open from 7 a.m. until midnight and often stay open later if they have enough customers. Open daily, 5 to 9 (and sometimes 10) p.m.
Open daily, 5 p.m. to midnight, on Fridays, open until 3 a.m.
Open daily, 7:30 a.m. to 11 p.m.
Open daily, 11 a.m. to 11 p.m.